The objective of Arbitration is to provide a flexible and efficient means of resolving disputes quickly, cost effectively, privately and confidentially without necessarily adhering to the formalised, technical procedures of litigation. Arbitration is a formal dispute resolution process whereby two or more parties agree to submit all or certain disputes between them to an independent person called an arbitrator, for a binding decision. The process is governed by the Arbitration Act 1996. An arbitrator’s decision, called an award, is binding on the parties and is enforceable as a judgment of the Court. Whilst Arbitration is closely related to litigation, there are several key differences which make it an important and attractive alternative to state litigation. In particular, arbitration gives the parties the power to choose their own decision maker, place and time of a hearing, and as far as they can agree, to control the arbitration procedures which may be varied to suit the nature and complexity of the dispute. Importantly for family and relationship matters, arbitration is a private process and is confidential to the parties. 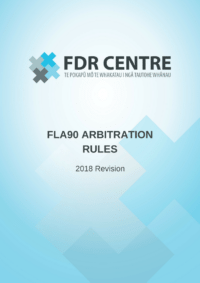 The FDR Centre operates at the cutting edge of modern dispute resolution in New Zealand, providing fully administered arbitration services governed by its comprehensive suite of Family Law Arbitration Rules, including expedited procedures and, most importantly, access to fixed fee and fee capped services. The FDR Centre’s services provide parties with the highest quality Family Law Arbitration services at a realistic and known price. 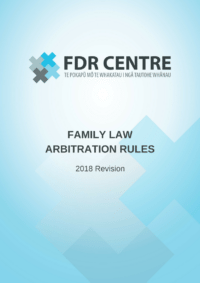 The FDR Centre has long established itself as a leader in private dispute resolution in New Zealand and these updated Rules will allow the FDR Centre to continue to offer a world class arbitration service that is tailored to meet the needs and requirements of parties to Family Law Disputes in a manner that is private, efficient, cost effective and certain. Are the Arbitral Tribunal’s fees capped? How long does the process take from appointment to the Award on all substantive matters? Within such time as agreed by the parties or determined by the arbitral tribunal. The Objective is to make a final award in respect of the substantive issues within 45 working days. The Objective is to make a final award in respect of the substantive issues within 60 working days. The Objective is to make a final award in respect of the substantive issues within 90 working days. Is there a hearing? Yes, unless agreed by the parties, there is a hearing at the Arbitral Tribunal’s discretion. No. Although the Arbitral Tribunal may exercise its discretion to convene a conference if necessary. Unless agreed by the parties, at the Arbitral Tribunal’s discretion but limited to 3 days. Unless agreed by the parties, at the Arbitral Tribunal’s discretion but limited to 5 days. Is there provision for a visit or inspection of the relevant location, subject matter, property, goods at issue? Yes, at the Arbitral Tribunal’s discretion. Yes, at the Arbitral Tribunal’s discretion. Yes, at the Arbitral Tribunal’s discretion. Yes, at the Arbitral Tribunal’s discretion.